Tokyo Gas Co. is introducing a home hydrogen fuel cell-based co-generation system to provide electricity, heat and hot water—but not, as does the Honda Home Energy System II (earlier post) hydrogen gas for vehicles. Not yet, at least. 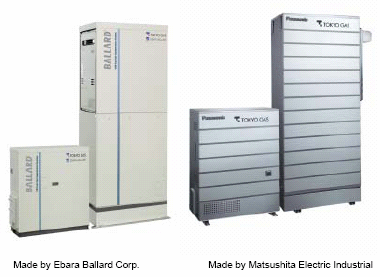 The systems, jointly developed with Ebara Ballard Corporation and Matsushita Electric will be on the market on a limited scale on February 8, 2005. Tokyo Gas plans to roll the system out more widely in 2008. The company will install 200 units in certain areas where maintenance capabilities have been established within Tokyo Gas supply area by the end of 2005. The company is offering a FC Partnership agreement for early subscribers: a ten-year contract at ¥1 million—approximately $9,726, or $81 per month. FC Partners will provide Tokyo Gas with operational data and feedback for the first three years. Tokyo Gas has established a standard hydrogen co-generation tariff with a maximum monthly charge of ¥9,500 (approximately $92). The 1 kW systems have a hot water tank capacity of 200 liters. The feedstock for the system is Tokyo Gas’s city gas—predominantly natural gas from LNG with the addition of some propane from LPG to adjust the calorific value. Hai,i had one project to do to my college about hydrogen future.i want to submit within two weeks.how we prepare and supply the hydrogen?so pls tell about this full details and tell clearly ok.pls sir help for me.i cant forgot u for my life long. i think if researches are going like alternative fuels. i am interested to generation electricity from various types i have ideas to develop home eletricity generation, solar system and generation from spring weels, alternative weels to run dynoma to produce electricity. it is mechanically so hydrogen generation is chemical bond generation electricity and gas i am very much interest to run my car on hydrogen gas so pls how it is possible and it is run car on hydrogen gas.pls tell us.